as “shaki” on our discussion forum. The bubonic plague that hit India in 1990’s started in central China in mid 19th century. It stayed in central China for several decades before it spread to the eastern parts of China in later part of 19th century. From eastern China, it spread through ships to the coastal areas of many countries. China lost more than 12.5 million persons to this plague. In India, the plague first hit the port cities of Bombay, Calcutta, and Karachi. Pune, a city near Bombay was also badly hit. Later, the plague spread to inner parts of India also. Published in PUNJAB GOVERNMENT ORDERS. Now let us look at Mirza Ghulam Ahmad prophesies, predictions and claims. 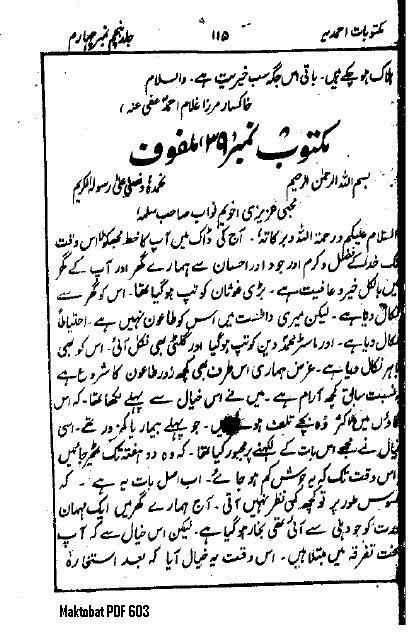 The plague will come to Punjab (Prophesy made in 1898). It has been shown above that the Government of Punjab knew of the imminent arrival of plague in February 1897 and had issued special emergency orders to cope with that. Mirza Sahib’s prophesy was a deceptive attempt to impress those who were not aware of the Governments prediction. The plague is sent by Allah in support of Mirza Sahib’s Prophet-hood. False. Bubonic plague was an ever recurring epidemic that killed millions of human beings over a period of centuries. The Third Pandemic Plague, that hit Punjab during Mirza Sahib’s time started in China in mid 19th century when Mirza Sahib had not even claimed to be a prophet. Could Allah have started punishing millions of human beings even before launching His new prophet? Very unlikely from Allah of Quran but which God did Mirza Sahib believe in? The Plague was especially sent by Allah to punish the people of Punjab for rejection of Mirza Ghulam Ahmad. False. While people of Punjab did suffer, the devastating effects of plague were hundreds of times more in China and much of it happened even before Mirza Sahib launched his prophet-hood claims. Even in India, the areas of Bombay and Calcutta suffered more badly than Punjab. False. No significant effect on resistance to the false claims of Mirza Sahib took place and there was no significant conversion to his faith. The plague subsided without establishing Mirza Sahib’s prophet-hood. Can Allah’s plans ever fail so miserably? Quadian will be a safe heaven and Mirza Sahib’s house will be completely immune from plague. Evidence has been shown that even in Mirza Sahib’s own home people were infected and were ruthlessly thrown out by Mirza Sahib from his alleged safe heaven. In this small booklet, Dafi-ul-Bala, Mirza Ghulam Ahmad has provided enough evidence to declare him a liar and a thoroughly evil person, without referring to any other evidence. Besides drastic failure of his prophesies, let us examine his character in the light of his claims. He claims to be a Messiah (a savior) and then wants Allah to kill people indiscriminately to establish his false prophet-hood. He claims to be a Maseel of Essa Bin Mariyam. Essa (AS) had a reputation of a great healer. Mirza brings death and suffering. And when he finds two of his servants being infected with the disease, he kicks them out of his alleged NOAH’s ARK. He claims to be the brooze and zill of Holy Prophet Mohammad (saw). The Holy Prophet (saw) is known as REHMAT-UL-LIL-AALIMEEN (a blessing for the mankind). Mirza proves him to be a LAANAT-UL-AALIMEEN ( a curse for the mankind) by praying for plague and when plague arrives, praying for more death and suffering. Who is the real Messiah?